On Monday, Picture Polish released another three blogger collaboration shades. Lets take a look at them shall we? 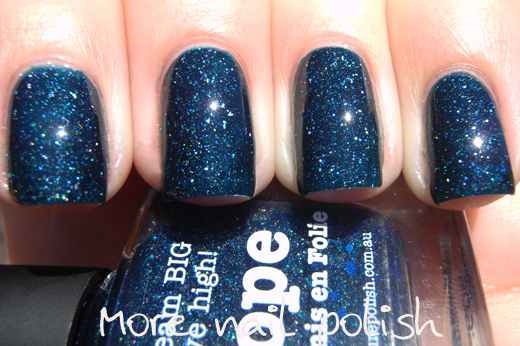 Hope by Vernis en Folie - A dark teal blue scattered holographic with medium sized royal blue hex glitters. 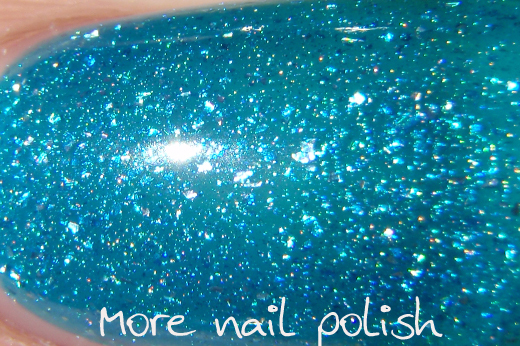 I did find that most of the blue glitters were in the bottom half of my bottle and I only got on glitter piece on my nail, on the outer edge of my pinky. I thought this was going to be very similar to Cosmos, but this is definitely has a green tinge and is certainly a teal shade and darker. My photos show it a bit brighter than it is because they are in full sun. This is three thin coats with Seche Vite top coat. 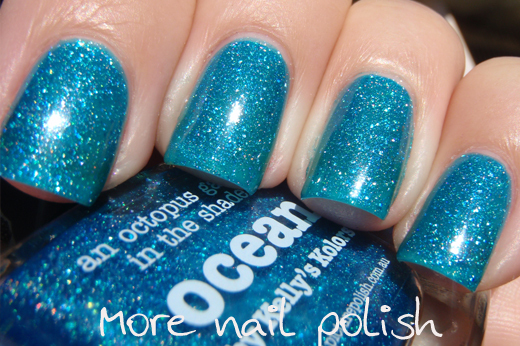 Ocean by Kelly's Kolors - A bright turquoise blue jelly polish with scattered holographic particles. I'm super happy to see another Aussie with a collaboration shade - way to go Kelly! I thought this might be similar to Ozotic 617, but this is much more green leaning and jelly like compared to 617. It looks lighter on the nail that it does in the bottle, but I'm sure if you wore more coats then it would look darker like the bottle. This was three thin coats with no top coat. Sparkling and stunning. 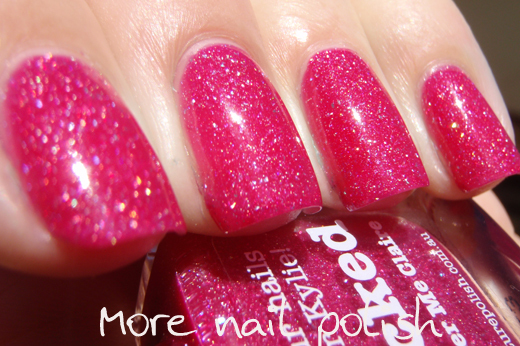 Shocked by Shatter me Claire - a bright a rich hot pink with the scattered holographic finish. 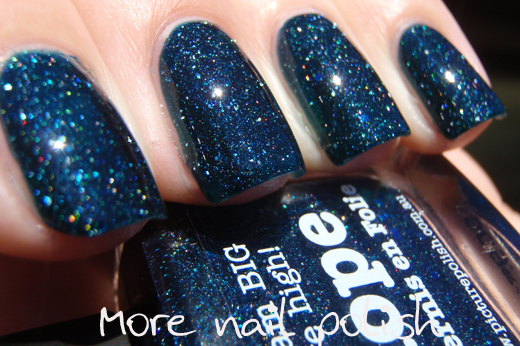 Another Aussie with a collaboration shade - Whoo hoo. I certainly remember Shatter me Claire's blog post about Tease during Blog Fest last year - who could forget that hair :). I don't usually wear many pink shades, but this looked really great on me. 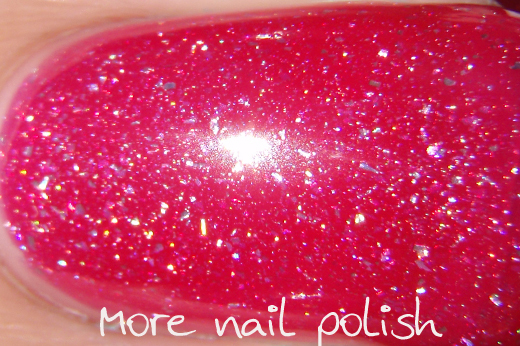 This polish fills a gap in the Ozotic 60 series too, as there is definitely no hot bright pink like this. This was three thin coats with no top coat. Really fabulous. You have made me want Shocked and Hope even more!!! 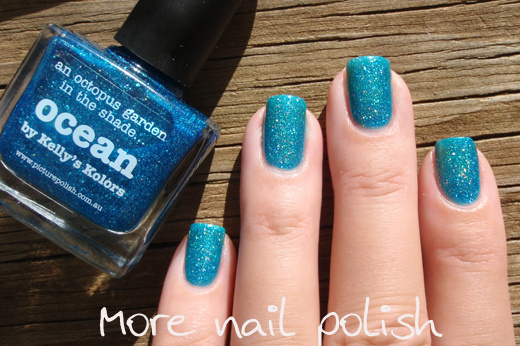 Gorgeous shades, Ocean is my favourite!